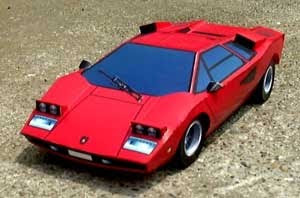 Despite the detailed appearance of this papercraft Lamborghini Countach LP400, it is actually a fairly simple build with only 26 parts. My favorite part of the model is that the template gives the option of having the headlights in either an open or closed position. Another nice touch is that there are three body color options: red, yellow and white. 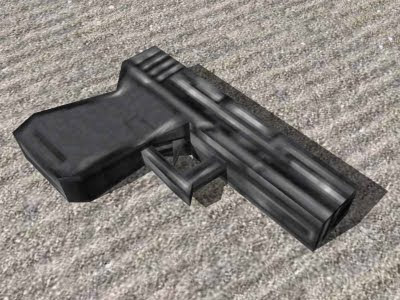 Created way back in 2000 by Japanese designer, Yasu Tanaka, the template for this 1:30 scale model is available for download here. One of my favorite science fiction movies is The Fifth Element, but papercraft models based on the film are virtually non-existent. This paper toy is one of the few examples I have come across. Now the face of this "Lila" Russian paper toy doesn't look much like Milla Jojovich in my opinion, but the costume and the orange hair are give aways that it is meant to be the character "Leeloo" from The Fifth Element. From the front, the oddly distorted body of the paper toy makes it look somewhat like an Egyptian sphinx. Everyone loves sock monkeys. A unique North American craft item, the first sock monkeys are thought to have been created sometime in the early 20th Century. Sock monkeys are crafted from the signature red heeled socks manufactured by the Nelson Knitting Mills (now Fox River Mills). The stuffed monkeys had become popular enough by 1920 that the Nelson Knitting Mills began including instructions on how to build them with every pair of red heeled socks they sold. 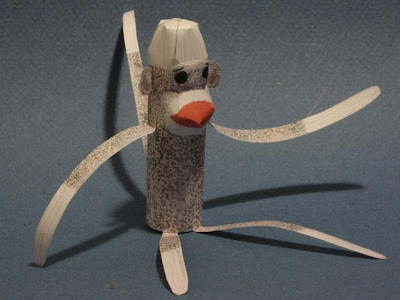 This simple papercraft sock monkey was created by Tyler Tinsley in 2008 and may be downloaded here. I have begun experimenting with a method of creating papercraft that involves using digital photos. For my first attempt, I grabbed a Campbell's soup can from the pantry and took a few photos from which I created a 1:1 scale papercraft model. I intentionally chose a Campbell's soup can because I think it brings up some interesting questions. Is papercraft art? 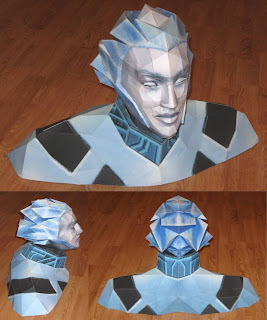 Most people would say that urban paper toys created by professional graphic designers are art, but what about papercraft created from 3D models ripped from video games? What about my soup can which is a life size paper replica of a real world object? I would like to believe that if Andy Warhol were still around he would say all these things are indeed art. In 2008, Warhol's 1:1 scale reproductions of a Brillo box, a Campbell's tomato juice box, a Del Monte peach halves box, and a Heinz tomato ketchup box together as a group sold for $4,750,000 at a Sotheby's auction. If only my papercraft tomato soup can would do as well. :) A download of the template is here. Well, it's not Cthulhu, but it comes close. Dubbed the "Elder Things" by the Antarctic explorers who found them in H. P. Lovecraft's novella At the Mountains of Madness, these creatures were thought by the explorers to be extraterrestrials who colonized Earth one billion years ago. 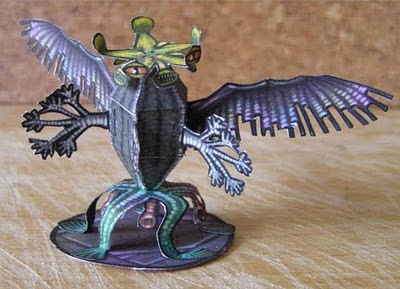 This papercraft Elder Thing was created by UK artist Wayne Peters for use in 28mm scale role-playing games. The PDF template is located here. 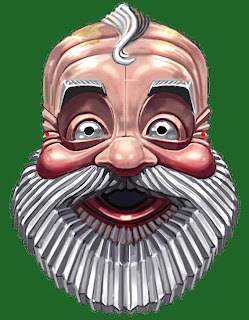 Both the 2005 and 2006 Christmas specials of the Doctor Who television show feature robot Santas. The robot Santas are villains who arm themselves with musical instruments that double as weapons. Their trombones fire mortar shells, their trumpets fire bullets and their tubas are capable of being used as flamethrowers! 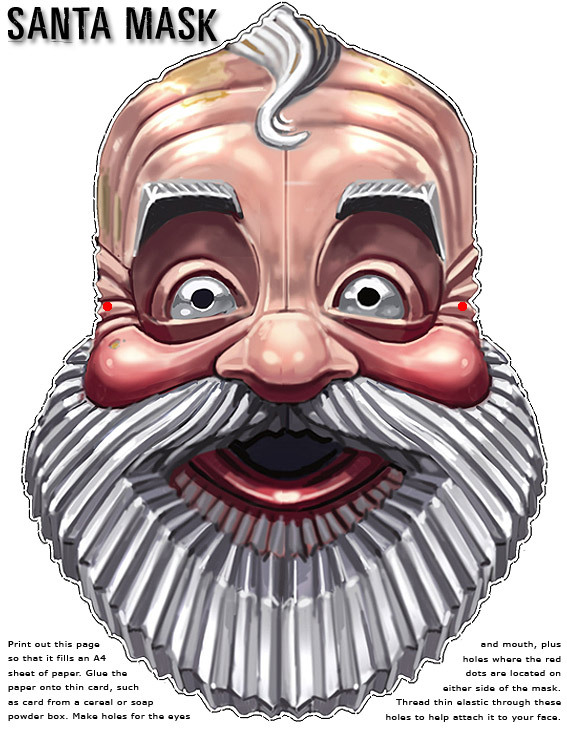 This 2D printable paper mask is by Peter McKinstry and is based on the robot Santas as they appeared in the 2006 special which is titled "The Runaway Bride". A download of the mask is available from the BBC website here. It amazes me sometimes all that you can build with cardstock. Such is the case with this working papercraft camera. 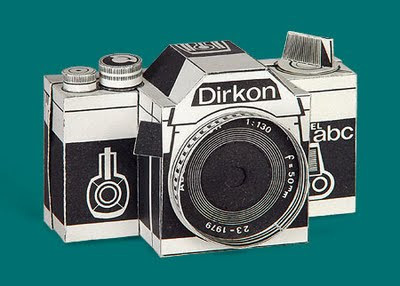 The template for this camera originally appeared in a 1979 issue of the Czech magazine ABC which is known for its excellent papercraft models. Using the same principle as pinhole cameras, this papercraft camera takes real photographs using 35mm film. A download of a scan of the template is available here at pinhole.cz, a website run by Czech graphic designer and pinhole camera enthusiast, David Balihar. 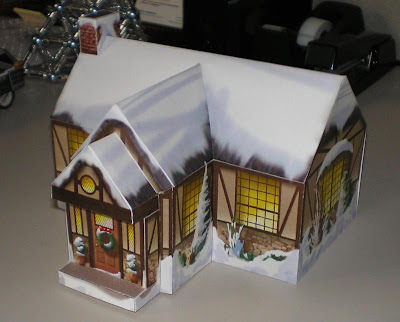 Ah, it's the time of the year for Christmas papercraft. This quaint little snow covered cottage is the work of designer Joshua Humphreys. I think he did a pretty good job on the textures. Since there are no instructions, building this becomes more of a Christmas cottage puzzle, but that is not necessarily a bad thing. ^^ The template for the cottage is located on Humphreys' deviantART page here. One of my favorite board games of all time is Heroscape. Heroscape is a customizable miniature gaming system that lets you build your own battlefields and create custom armies from a wide assortment of characters such as dragons, secret agents, robots, samurai, vikings, aliens, cowboys and orcs. You can imagine my delight when I found something that combines two of my favorite things: papercraft and Heroscape. This papercraft dice tower was created by a Heroscape enthusiast for use with the game and contains nice touches such as some surprise images on the baffles inside the tower that can be seen when looking down though the hole in the top. 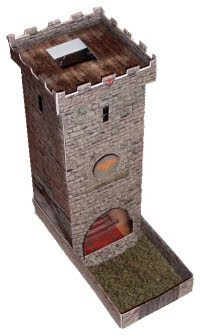 The template for the tower may be downloaded from the Heroscapers forum here. 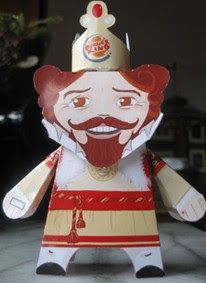 The Victoria & Albert Museums of England are offering an antique toy circus papercraft on their website. The original template for the circus was created by a French company around 1930. The best part of this papercraft is that it is an automata of sorts. Twirl the flag on top and the performers spin around like a merry-go-round. In addition to the usual cardstock, a piece of cork and a barbecue skewer are also required to build the circus. 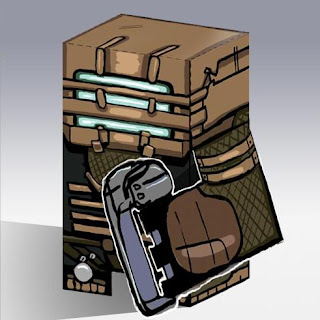 The template for this papercraft may be found here. The Dodge M37 is a three-quarter ton four-wheel drive truck that was used extensively by the US Army during the Korean War. I don't know for sure, but I think versions of this truck probably appeared in the M*A*S*H television show which was set during the Korean War. 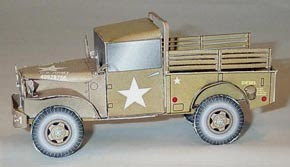 This papercraft is offered by a member of the Military Vehicle Preservation Association who owns a real life M37 which he restored himself. A PDF template of the truck is available here. 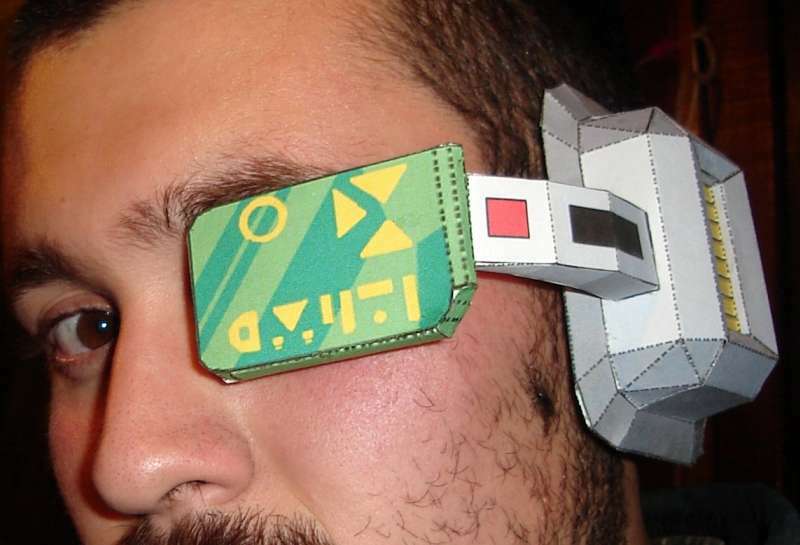 A scouter is a device commonly worn by soldiers in the Dragon Ball Z animated series. Scouters perform numerous functions including power level readings of opponents and interstellar communication. The papercraft scouter pictured above is a modification by deviantART member Ryo007 of a template located here. Ryo007's version has a larger lens than the original and may be downloaded here. Another one of those fantastic comic book characters created by writer Stan Lee and artist Jack Kirby, Galactus is a giant being described in the pages of one Marvel comic book as "the most awesome living entity in the cosmos". To befit Galactus' titanic stature, deviantART member Viper005 has created a king size custom Cubee papercraft which is greater than twice the size of a usual Cubee (see the blank normal size Cubee in the photo for comparison). 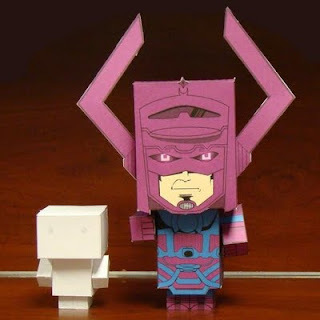 The two page template for this Galactus Cubee may be found here. 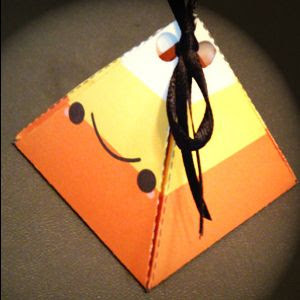 Halloween is past, but since it is still candy corn season I couldn't pass up posting this cute papercraft. :) This is a glue-less gift box that is held together only by a ribbon at the top. I think it would be cool to put some real candy corn inside some of these boxes and give them away on Thanksgiving Day tomorrow (Happy Thanksgiving! BTW). This candy corn box was created by deviatART user "Soupcomplex". The template is located here. Special thanks once again to Indy Magnoli at Indyprops.com for his help in producing this papercraft. When I was young, my dad took me to see the Blue Angels Aerobatic Team, so I had to smile when I saw this papercraft. The jet which the Blue Angels used in the late 50's and mid-60's was the F11F Tiger. The F11F was the second aircraft of the U.S. Navy with supersonic capabilities and also the first fighter known to have caught up with the bullets of its own gun. The template for this F11F (as well many other 1:60 scale aircraft by German designer Christoph Stahl) may be found here. 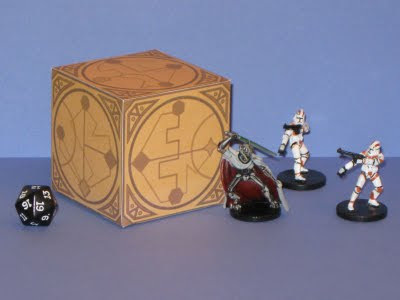 Occasionally, people who play roleplaying games (RPG) like to create props to enhance their game play experience. 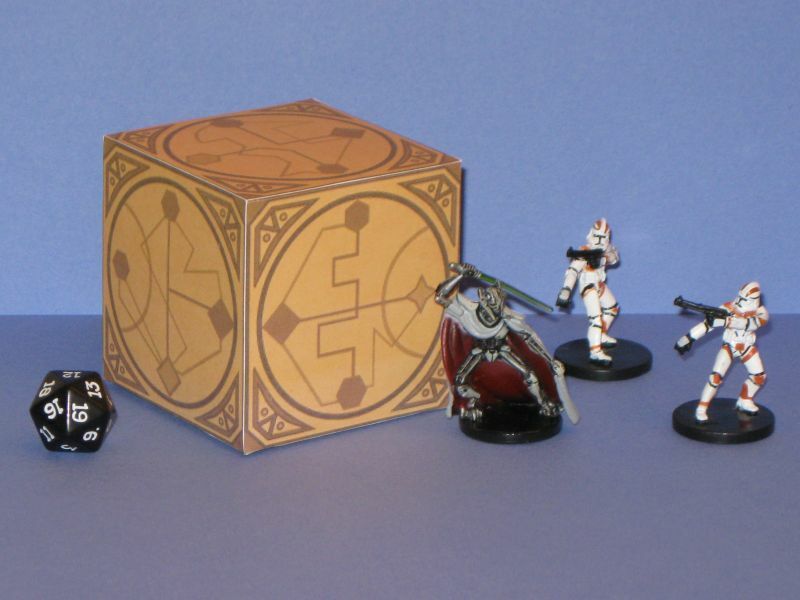 Such was the case when Wizards of the Coast forum member Ironlightsaber created this papercraft Jedi holocron for a campaign he wrote for the Star War Miniatures RPG. This cube shaped holocron was designed to be put together without glue, but for the one I built I went ahead and glued it anyway so that the seams would be tighter. The template for the holocron may be downloaded here. Illustrator Bob Staake designed an art studio building for himself which he then had built near his 200 year old house in Chatham, Massachusetts. 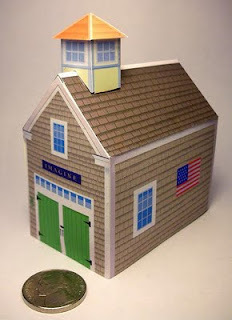 The Cape Cod Style studio features a cupola on top that acts as a skylight to provide natural light to the workspace inside. 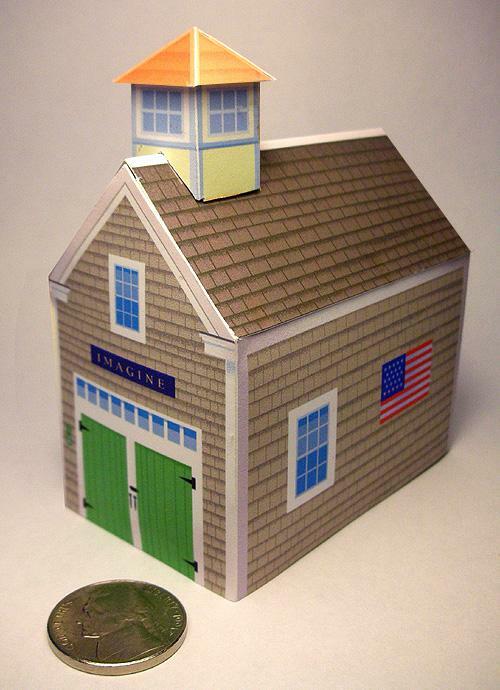 This papercraft model of the art studio was done by Mr. Staake himself. 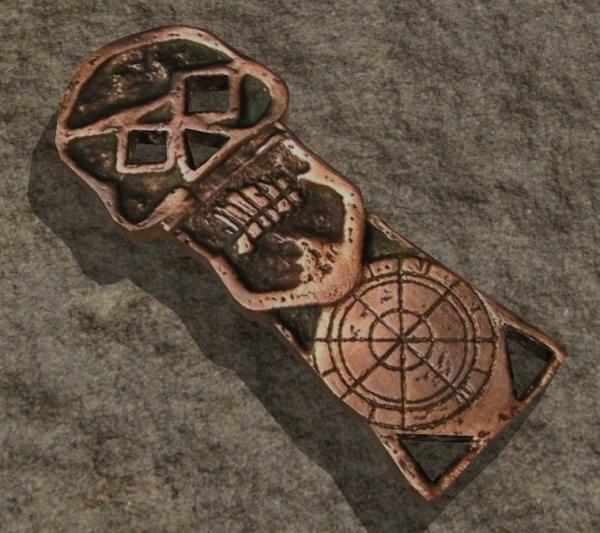 It is quite small as you can see by the nickel placed next to the model for reference. A copy of the one page, three piece template may be downloaded here. This papercraft was created from archaeological drawings of the Hedeby sea chest, an actual Viking artifact. Created by Lodin, a member of the Fjellborg Viking Reenactor Society in Colorado, the paper model was originally put together as a design aid when he was in the process of building a life size functional wooden model of the chest. 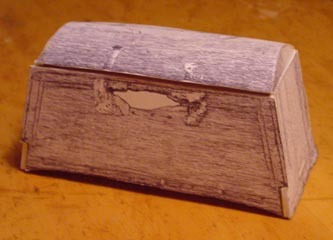 Photos of the finished wooden chest and also a download of the paper model template may be found here. DeviantART user Cyberdrone has done some creative reworking of the glue-less Cubee paper toy template to create some awesome Ghostbusters movie props. On the left is a psycho kinetic energy (PKE) meter which the Ghostbusters use to detect the presence of ghosts. On the right is a ghost trap used to contain ghosts after they are captured. 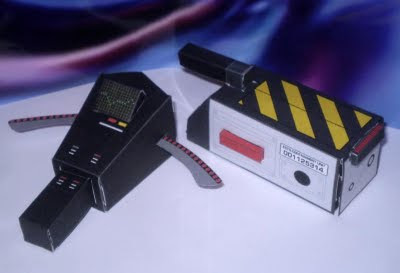 Check out these and other custom Ghostbusters Cubee creations on Cyberdrone's page here. The folks at NASA are working on a pilot-less, rocket-powered airplane to perform an Aerial Regional-scale Environmental Survey of Mars ("ARES" for short). If eventually deployed, the ARES Mars Airplane will record information previously unobtainable on the atmosphere, surface and interior of Mars. 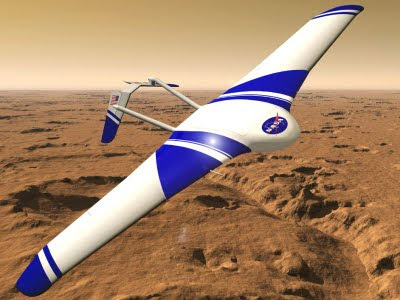 The ARES design team has posted a 1:36 scale papercraft version of the Mars Airplane that actually flies. The template for the model may be found here. Here is the final mask in the Death Eater mask series. Some officially licensed product manufacturers list masks similar to this one as "Bellatrix's mask" while other sources indicate that a mask design like my papercraft Death Eater Mask #1 is the mask of Bellatrix Lestrange. If there is a Harry Potter fan out there who can clear up this discrepancy, please let me know. :) The template for Mask #7 may be downloaded here. UPDATE 7/15/2011: This is no longer the final mask in the series! ^^ There are now Mask #8 and Mask #9. Here's a big "Thank you!" to everyone who supported my efforts in the past year. God willing, I am looking forward to another productive year of papercrafting fun. I don't want to use the word "obsessed", but Japanese papercrafter Masanori Shimozato is definitely enthusiastic about Jeep Cherokees. 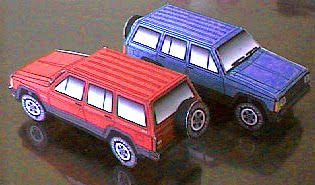 Shimozato's papercraft webpage has models of what appears to be every color and trim package available for the 1996 Jeep Cherokee (and that includes both the US and Japanese versions of the vehicle!). To download a template of one of the 47 different Cherokees, take a look here. 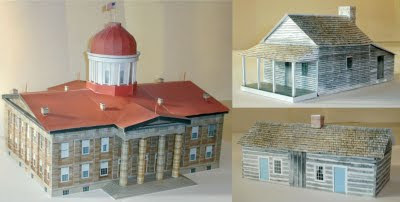 In honor of the 2009 Bicentennial of Abraham Lincoln's birth, the Illinois Historic Preservation Agency has released five HO (1:87) scale paper models of historic Illinois buildings associated with Abraham Lincoln. Five more buildings in the series are expected to be released before the end of the year. In addition to the Lincoln Bicentennial series there are also ten "Main Street" papercraft buildings available for download, eight of which are Victorian style architecture, with the remaining two building being Art Deco and Prairie Style. The templates for all the architectural models are free and may be downloaded here. Apparently the real life Frankenstein Castle near Darmstadt, Germany now houses a restaurant and dinner theater! 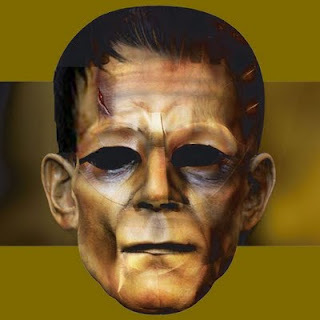 As part of the restaurant's 2009 Halloween festivities they are offering on their website a nicely done, printable 3D Frankenstein monster mask (kind of looks like Boris Karloff doesn't it?). The link for the PDF papercraft template may be found here. Instructions for assembling the mask are in German only. The tyrannosaurus rex is in the top ten of most everyone's list of favorite dinosaurs, so it is no surprise that natural history museums like to have fossilized t-rex skeletons as a draw. 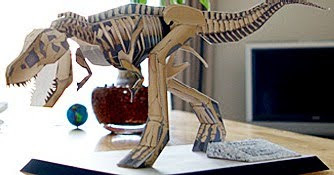 Now thanks to the Paper Museum website operated by the Sanwa Paper Company you can have your own miniature tyrannosaurus skeleton at home. Look for the download at the bottom of the page here. 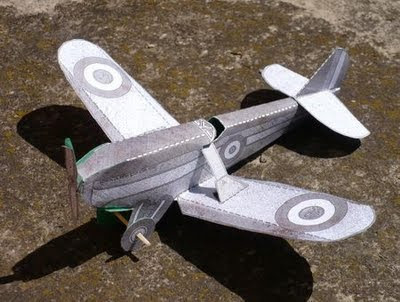 The first thing you probably will notice about this airplane papercraft is that there is no color. The reason for the lack of color is the template was printed from a microfilm of an old newspaper. The original template was published on June 30, 1934 in “Boys and Girls”, the weekly children’s supplement to the Daily Mail, a British newspaper. The instructions claim the model will glide nicely if the nose is properly weighted. 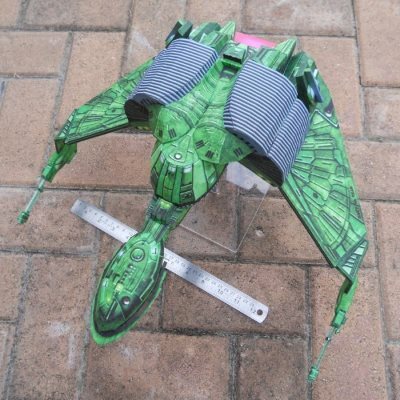 Look for a link to the template here in Brett Holman's article on the toy aeroplane at Airminded.org. Five masks down and two more to go. 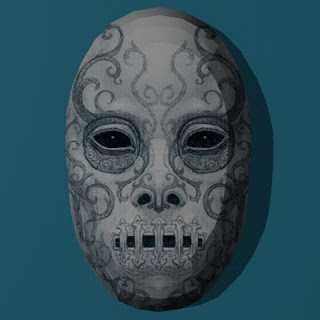 Like Death Eater masks number one and two, this mask is based on a drawing rather than a photograph. 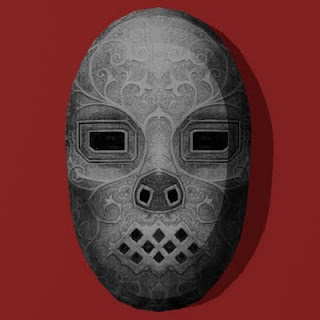 The picture above really doesn't do justice to the intricate detail that can be seen in the PDF template of the mask. 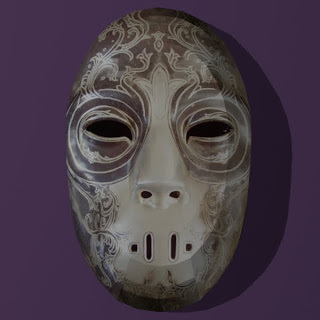 The drawing this papercraft is based on may have been done as a preliminary design by whoever built the metal mask that Death Eater mask #3 was based on. As usual, there are full size and half size templates available for download here. 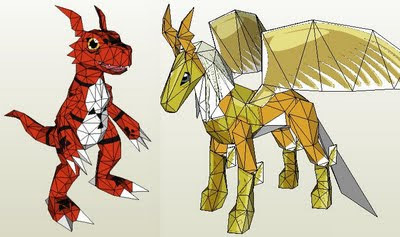 With all the Pokemon papercraft around I have always wondered why there wasn't more Digimon papercraft. Things are looking up for Digimon fans though now that POdragon (one of the Paperpokes team) has ventured into creating some papercraft of Digimon characters. Finished so far (from left to right) are Guilmon and Pegasusmon. The Guilmon model is nice in that it comes in a optional black version and is also designed in such a way that the finished pose of the model is customisable. Template downloads of each of these are available from POdragon's deviantART site here and here. Another papercraft Death Eater mask is finished! This one is based on what appears to be a photograph of a painted ceramic mask. My goal is to complete a total of seven different masks, so this one puts me just over halfway through the series. Download the template for mask #4 here. Tanks were considered high tech weaponry during World War 1. However, to modern eyes the tanks developed during "the War to End All Wars" have an odd, almost Steampunk look. 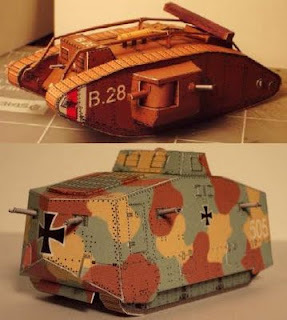 These papercraft are two of several 1:72 scale WW1 models created in 2006 by Clifton W. McCullough. Pictured on top is a British Mark IV heavy tank. Below is a German A7V heavy tank. Templates for a total of seven different WW1 tank models as well as a model of a German Halberstadt CLII fighter-bomber are available at McCullough's web page here. 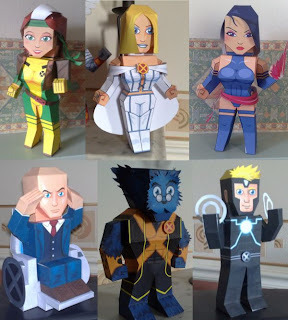 I stumbled onto a fledgling papercraft blog called My Paper Heroes (run by UK papercrafter Xavier Leo Gale-Sides) and I was delighted to find numerous X-Men papercraft. Pictured above are Rogue, Emma Frost, Psylocke, Professor Xavier, Beast, and Havok. Other X-Men characters available for download include Angel, Cyclops, Colossus, Archangel, Wolverine, Iceman, Cannonball, and Jamie Madrox. And as if that wasn't enough, there are also models of the Incredible Hulk and the Silver Surfer. Look for more Marvel Comics papercraft in the future from Gale-Sides. His blog is located here. I usually don't consider printing papercraft on anything other than white cardstock but, as you can see from these papercraft Lament Configurations, other materials can give you great results. The two smaller cubes on the left were printed on colored construction paper using a black and white template. However, the cube that interests me the most is the one on the right in which the same black and white template was printed on gold metallic paper. I can see lots of possibilities for using this technique, everything from Christmas ornaments to shiny metal weapons. 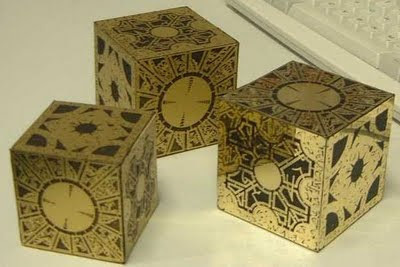 These Hellraiser papercrafts are the work of Ulrich Schreitmueller of Germany. Information on how he built the puzzle boxes may be found here. Another papercraft Harry Potter Death Eater mask is complete. 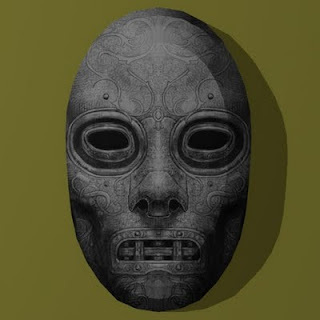 This one is a little different than the previous two Death Eater masks in that the image used to make the model is a photograph of an actual metal mask rather than a line drawing. The ornate patterns on the original metal mask were very nicely done by whoever the craftsman was. A download of the template is here. If you have an extra deck of playing cards on hand and feel like building something cool, here is just the thing. 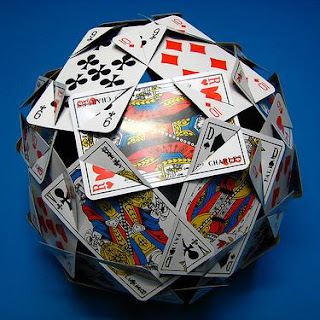 This 30 sided, slide-together playing card construction is the creation of Francesco De Comité. 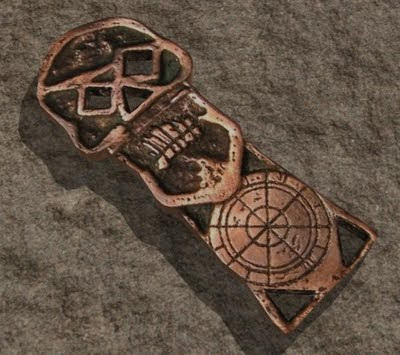 I think it would be interesting to see one of these constructed out of other types of cards or even a standard deck of cards with the backs facing outward instead. Now if I can just find the time...^^ De Comité's template may be found here. 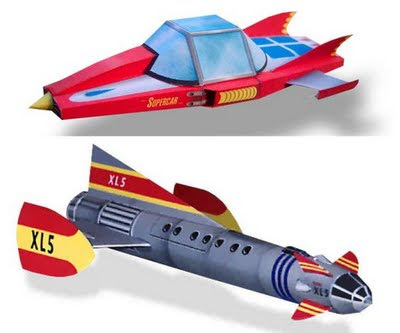 In the early 60's, long before British television producer Gerry Anderson produced TV shows like Space:1999 and Thunderbirds, he created two shows, Supercar and Fireball XL5. Each of the productions was a science fiction children's show that featured Anderson's signature marionettes which later became so well known on the Thunderbirds show. 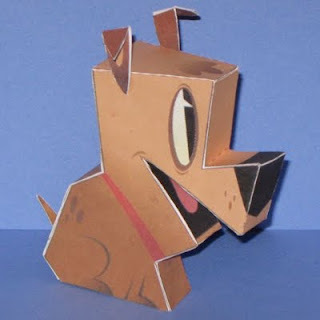 These two papercraft were created in 2001 by Pierre Fontaine as an homage to the shows which are now largely forgotten. Free template downloads of the retro spacecraft are available here along with a template for a papercraft Queen Anne style house. 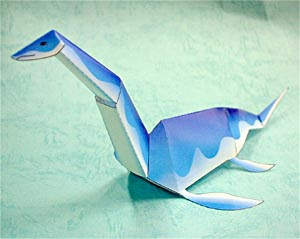 When I first came across this papercraft I thought it might be a dinosaur, but after I translated the Japanese I found instead it was a papercraft of Nessie, the Loch Ness Monster. Now we just need some paper models of Bigfoot and a chupacabra to make the set complete. ^^ The template for Nessie is offered by the Mochizuki Printing Company here. The second mask is finished in the papercraft series I am doing on Death Eater masks. This one is a little less ominous than the first one. 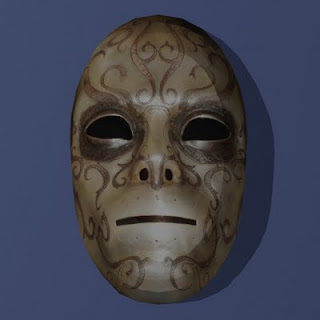 As with the first mask, this papercraft is based on artwork which can be found at the Harry Potter and the Order of the Phoenix movie website. I won't bore you with size information this time as it is the same as the last mask. Download the template here. It has been a while since I posted a car papercraft. 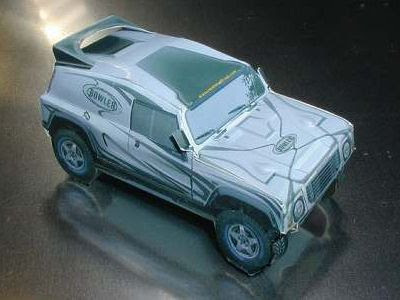 This hot looking off road racing vehicle is a Bowler Wildcat 200 which was originally produced in the UK by Bowler Off-Road LTD. Bowler Off-Road offers this papercraft on their website. In addition to eight different color schemes for the Wildcat papercraft, they also offer a papercraft model of a Bowler Spirit Race Truck. Get the templates here. 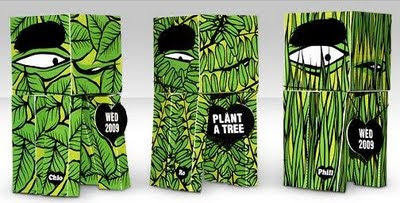 These odd little plant monster paper toys are free downloads created by Jellyface to encourage the planting of trees on “World Environment Day” which this year was on June 5, 2009. From left to right the names of these creatures are "Chlo", "Ro" and "Phyll". Get it? Chlorophyll is the green pigment in most plants. Jellyface is a project between Joe, a graphic designer, and Fau, a creative dressmaker who are based in Italy. Their primary work is plush toys that look very similar to these paper toys. Go here to download templates for these three. There is also a "coral monster" named, of course, "Coral" and a blank template you can customize and submit for a contest, but hurry the contest deadline is September 30th. The official movie website for Harry Potter and the Order of the Phoenix contains a "Death Eater Art" section where you can download an "art kit" with example images of Death Eater masks meant to inspire you to create your own art. It just so happens that several of the images in the art kit work nicely when applied to my Kanonashi Mask template. 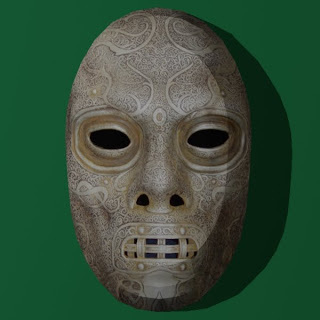 So here is the first of what I hope will be several different papercraft Death Eater Masks. Death Eaters are the devoted followers of the dark wizard Voldemort, the prime enemy of Harry Potter throughout all the books in the Harry Potter series. 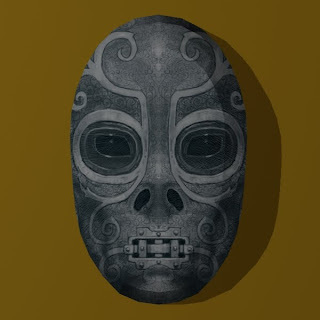 Update 10/13/09: More papercraft Death Eater masks are available here. From the Gavin Schmidt (the same designer who gave us the Harry Potter paper toy) comes another creation using the "Briki" paper toy template. This time the subject is Isaac Clarke, the main character from the Dead Space video game. I kind of like the hand drawn look of the art. Get your own printable template here at robotmartini.com. 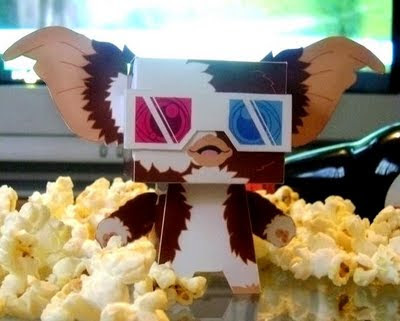 I thought Mexican graphic designer Sercho05 did an excellent job with the graphics on this Gremlins paper toy. Another nice feature of the toy is that the 3D glasses are removable. Now it's been a long time since I saw the movie, but one thing I do know is that you should make darn sure it's not after midnight before you go dropping Gizmo down in a pile of popcorn like that. ^^ The template for this paper toy is available here.